What do you need to consider to make the right durable label decision? Labels are an integral part of durable manufactured goods and the data printed on these labels enables tracking throughout the products’ life. 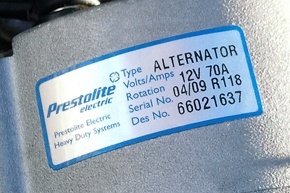 If product or component labels fail there is a direct financial implication or impact on the reputation of the product manufacturer. When you look for a solvent resistant label solution, what things do you need to consider to ensure you make the right decision for your business? What will your Product ID Labels, Warning Labels, Component ID or Rating Plate Labels be exposed to? CILS solvent resistant label range provides maximum resistance to these harsh industrial chemicals and solvents, both during production and long after your product has left the factory floor. Whilst you may consider solvent resistance as the primary importance, also consider “other” factors such as exposure to environmental conditions like ultraviolet rays, harsh weather conditions or extreme temperature fluctuations, as well as abrasion. CILS solvent resistant labels can withstand temperatures ranging between -180°C to +388°C and can handle exposure to repetitive handling and harsh weather conditions. Industrial applications such as components, electrical equipment, pumps and valves, motors, drives, engines or engine parts, are all constructed of different materials and therefore have very different surfaces which labels need to adhere to. CILS solvent and ultra-solvent resistant label range has been designed with a permanent adhesive that has been tested and perfected over the past 30 years to provide superior bonding on a variety of surfaces, including textured, hard-to-stick or low energy surfaces. Knowing the life cycle of your label up-front is critical so that you can choose the correct label. Do you require your label to be permanent, removable after a while or will you require some evidence of tampering if there is an attempted removal of the label? 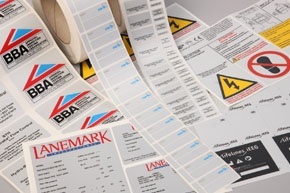 Or are you replacing metal rating plates with more affordable durable labels that have the option for you to print your own variable data directly onto the label whilst still maintaining solvent resistance and maximum durability? Once you have identified the types of industrial labels you require, you can find the best solution to produce your labels and print variable data such as product IDs’ serial numbers, barcodes, etc. The unique CILS computer printable surface coating allows variable data to be printed on the labels in minutes, straight from an existing PC and Laser or Thermal Transfer printer (using the correct CILS printer ribbons). The benefits of using your existing laser printer or thermal transfer printer means no capital outlay, and gives you an element of control over how many labels you use and how frequently you need to print them. CILS can also pre-print solvent resistant labels, ready for you to apply your variable data using your own PC and printer – an efficient and convenient hi-tech 'print-and-apply' solvent resistant labelling solution. Unique CILS printable coatings provide ultimate solvent resistance without secondary lacquers or laminates. Printable straight from your PC and standard laser or thermal transfer printer. Industrial-grade adhesives for permanent labelling. Suitable on all surfaces, including smooth, textured, powder-coated, cast metal, curved, surfaces, etc. Add value to your product with a professional label appearance. Labels made to any size, shape and design to match your specific requirements and with no tooling charges. ...get in touch with one of our experts.